Arkonix Mining provide no information about who owns or runs the business on their website. The Arkonix Mining website domain (“arkonix.eu”) was privately registered on September 16th, 2017. The Arkonix Mining website uses both USD and EUR as currencies, suggesting whoever is running the company is also based out of Europe. This corresponds with an address in Ticino, Switzerland provided in the footer of the Arkonix Mining website. Arkonix Mining has no retailable products or services, with affiliates only able to market Arkonix Mining affiliate membership itself. Arkonix affiliates invest funds on the promise of a 5475 day ROI. Based on corresponding hash power values, the expectation is the more an Arkonix Mining affiliate invests the higher their ROI. Arkonix Mining pay residual commissions via a unilevel compensation structure. Arkonix Mining cap payable unilevel levels at eleven, with commissions paid out as a percentage of invested funds across these eleven levels. Note that Arkonix Mining provide no explanation for the Arkonix Mining Pool or what partnership shares are. Arkonix Mining claim to be a ‘Swiss-Based Cloud-Mining service provider‘. Other than the Swiss address provided on the company website however, there is no evidence to support either claim. As far as the business model goes, Arkonix Mining combines potential Ponzi fraud with pyramid recruitment. MLM mining companies need to provide both evidence of mining taking place and revenue generated from mining actually being used to pay affiliates. Arkonix Mining provide neither, which is not surprising seeing as the company doesn’t even disclose who owns or runs it. The lack of disclosure regarding Arkonix’s mining operations is important, because without such disclosures there’s a good chance the company is just recycling newly invested funds. Typically an MLM company claiming to mine eventually provides photos or video footage of mining equipment. This alone is not enough to verify revenue from mining operations are being used to pay affiliates. This is especially true of Arkonix, whose provided mining statistics already appear quite suspicious. As per the screenshot to the right of Arkonix Mining’s website, 66 days of mining, 1990 affiliates, $91,550 generated and… only $323 paid out? 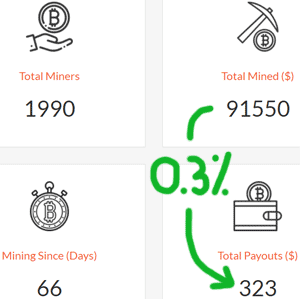 Granted Arkonix Mining impose a minimum $50 withdrawal limit, but still those numbers look fudged to me. And bear in mind that even if evidence of mining is shown at some point, an MLM company claiming to use mining revenue to pay affiliates has to prove it’s 100% of the revenue used. Generating a token amount of ROI revenue from mining and the rest from new investment is still Ponzi fraud. The rest of Arkonix Mining’s compensation plan is pyramid fraud, paying affiliates both directly and residually to recruit new affiliates. This of course supports illegitimacy with Arkonix Mining’s mining claims, as a genuine cloud mining company should be able to generate profit without having to operate as a pyramid scheme. When you combine all of that with the fact that Arkonix mining is being operated by who knows who from who knows where, there’s not a lot going for it. At the very least the pyramid side of Arkonix Mining will collapse when recruitment drops off. And I suspect the end of Arkonix’s “mining operations” will follow shortly thereafter too. Did a bit of post-publish research on Arkonix, turns out commissions are paid 40%/60%. That is to say 40% of withdrawals must be reinvested back into the company. That probably explains the low payout. Anyway, no reason for a legitimate MLM company to withhold 40% of earned commissions. Arkonix seems to be favored by investors/leaders from the faltering SwissCoin project.